Introducing reactive light hit indicators at the 2019 SHOT Show, MagnetoSpeed adds a new twist to plain old target shooting. Better thought of as the home of longhorn cattle and high-caliber college football, Austin, Texas definitely has its geeky side. Strange as it might sound, this is a good thing for shooters. It just happens that a certain pack of these number-crunching tech types also happen to be gun guys and have turned their studied, data-driven eyes to improving shooting. If you’re into ballistics you might have heard of them — MagnetoSpeed. Yup, the group with the extremely lightweight and convenient barrel-mountable chronograph that uses electromagnetic sensors to deliver insanely accurate velocity readings. Unsatisfied to stay in their own lane, the group of innovators has turned its attention to another area of shooting recently with some interesting results. Fair to say, they’re shedding a whole new light on target shooting. The Target Hit Indicator is a simple idea. Basically, it’s an impact-sensitive light that activates once a steel target is struck with a bullet. Pretty uncomplicated, yet powerful. If you’ve ever stretched the legs of your rifle, particularly without spotter assistance, you understand this is a dynamite concept. But it goes way beyond being a notification system to let you know your copper-jacketed lead is landing where you need it. Programmable, the Target Hit Indicator is also potentially an invaluable training aid, allowing you to test your limits in numerous multiple-target engagement scenarios or under the unforgiving clock. This is a boon for riflemen who, for too long, have been satisfied with banging static steel. Given MagnetoSpeed has a handgun target model available too, the device is also another arrow in the armed citizen’s training quiver. It certainly beats punching away at paper at the local indoor range — just like you did last week, and the week before that. MagnetoSpeed got its start pushing the limits at the firing line. Now with the Target Hit Indicator, it’s doing the same at the other end of the range. For more information on the Target Hit Indicator, please visit www.magnetospeed.com. 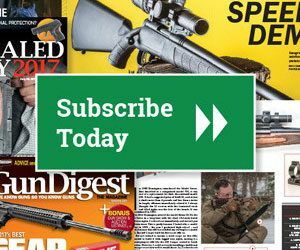 ❰Can You Trust Handloads For Dangerous Game?